The greatest of thieves are sometimes tasked to take far more than their victim’s belongings. 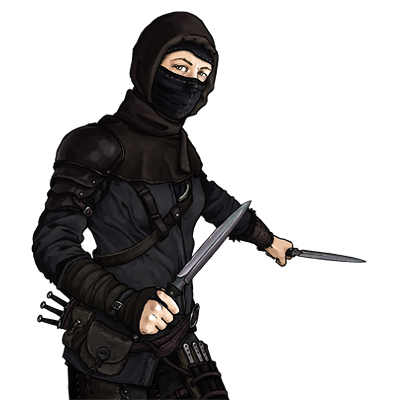 Masters of knife-fighting and uncannily light on their feet, these menacing figures will employ any means to dispatch their victims, be it poisoned knives thrown from afar, or a dagger planted in the back. 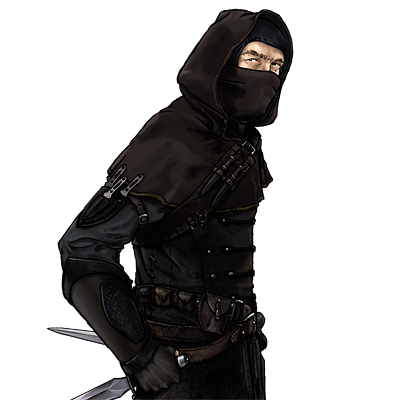 Deadly at night, assassins are less able fighting under the sun. This unit has an attack that has 3% chance per level difference to instantly kill an enemy unit. If there is an enemy of the target on the opposite side of the target while attacking it, this unit may backstab, inflicting double damage by creeping around behind that enemy. This unit’s marksmanship gives it a high chance of hitting targeted enemies, but only on the attack. The victims of this unit’s poison will continually take damage until they can be cured in town or by a unit which cures.